The oil market will be assessing the impact of last week's OPEC meeting in Vienna. OPEC and its 10 non-OPEC partners agreed to raise their crude output, bringing production back in line with levels originally agreed in November 2016. That brings us to our social media question of the week: What will be the long-term impact of OPEC's decision? Tweet us your thoughts with the hashtag #PlattsMM. Traders will be reading the runes for any indication that China is reducing its crude imports from the US in the wake of the growing trade dispute between the two countries. Meanwhile, US President Donald Trump threatened to impose 20% tariffs on imports of European cars Friday. The threat came as the bloc imposed tariffs of up to 20% on a range of US goods in response to US tariffs on steel and aluminum. In the Turkish coal and petcoke markets will be weighing the immediate impact of 5% and 4% tariffs slapped on US-origin coal and petcoke products Friday. While Turkey might want cheaper coal, Germany's coal commission will meet for the first time Tuesday in its quest to set an end-date for coal-fired power generation. Finally, there will be some required reading this week, as international energy watchdog the IEA publishes its hotly-anticipated annual gas report on Tuesday. In this week's highlights: the impact of trade tensions on US crude exports will be closely monitored; Turkish tariffs are under the spotlight; and Germany will consider how and when to end coal-fired power generation. But first: the oil market will be assessing the impact of last week's OPEC meeting in Vienna. OPEC and its 10 non-OPEC partners agreed to raise their crude output, bringing production back in line with levels originally agreed in November 2016. S&P Global Platts Analytics expects the deal to result in a net realized production increase for OPEC members of 700,000 b/d. 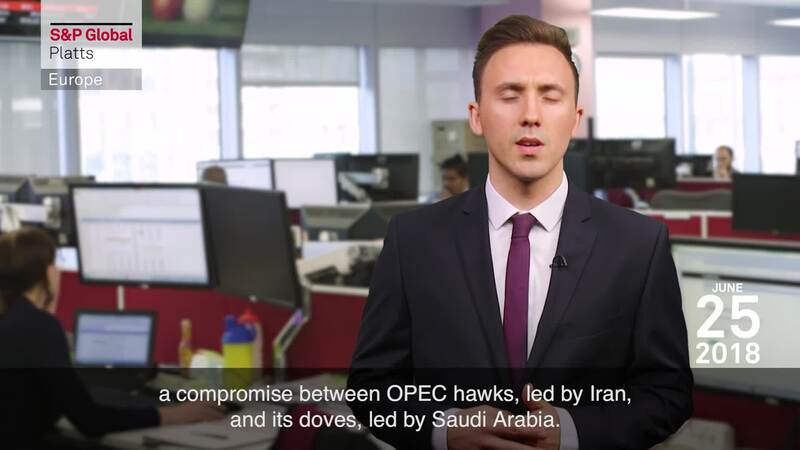 The agreement represents a compromise between OPEC hawks, led by Iran, and its doves, led by Saudi Arabia. Traders will be reading the runes for any indication that China is reducing its crude imports from the US in the wake of the growing trade dispute between the two countries. China has suspended publication of detailed trade data for a second straight month in May, indicating tensions with the US remain high and a further escalation may be on the cards. Early last week, China put forward an additional 25% tariff on $50 billion worth of US goods, including crude oil. Consequently, some traders expect Europe to become a recipient of US sweet crudes that would otherwise have been shipped to China. Elsewhere, US President Donald Trump threatened to impose 20% tariffs on imports of European cars Friday. The threat came as the bloc imposed tariffs of up to 20% on a range of US goods in response to US tariffs on steel and aluminum. The news has caused dismay in Europe's steel sector, which complains it would effectively be hit twice by US measures. And it is not only Europe which is imposing tariffs on imports from the US. The Turkish coal and petcoke markets will be weighing the immediate impact of 5% and 4% tariffs slapped on US-origin coal and petcoke products Friday. The 5% tariff on coal was slightly less than the 10% expected, and came just two days before Sunday's snap elections. The move to impose any tariff was strongly opposed by utility buyers, who would be able to buy high-sulfur US coal following an expected move to raise sulfur limits to 3% after the elections. US coals were expected to displace low-sulfur coals from Colombia. While Turkey might want cheaper coal, Germany's coal commission will meet for the first time Tuesday in its quest to set an end-date for coal-fired power generation. This is expected to be around 2040. Coal still accounts for almost 40% of power generation in Europe's biggest economy. The commission's members range from Greenpeace to mining unions; and its key challenge will be how to replace jobs in lignite-mining regions with new growth sectors. The process will be controversial, but the outcome will reshape Germany's energy landscape. In France, a similar consultation is expected to present its first report on long-term energy plans. The aim is to reduce nuclear, but the deadline has already shifted beyond 2025. Finally, there will be some required reading this week, as international energy watchdog the IEA publishes its hotly-anticipated annual gas report on Tuesday. The report is expected to give an update on prospects of European gas demand growth, LNG market dynamics and global supply. Does the agency see continued strong demand for gas? All will be revealed. Elsewhere, the bunker fuel market will be looking to Singapore's marine fuel sales data for June. The data's due for release by the Maritime and Port Authority on Thursday. Any increase in Singapore's bunker sales may suggest the displacement of demand from Fujairah, where bunker volumes are expected to fall due to the ongoing tensions between Qatar and its Arab neighbors.